Shot just before full sunrise which gives this photo some nice soft colours without a lot of saturation. I was lucky to get calm winds which alowed me to get a decent reflection. 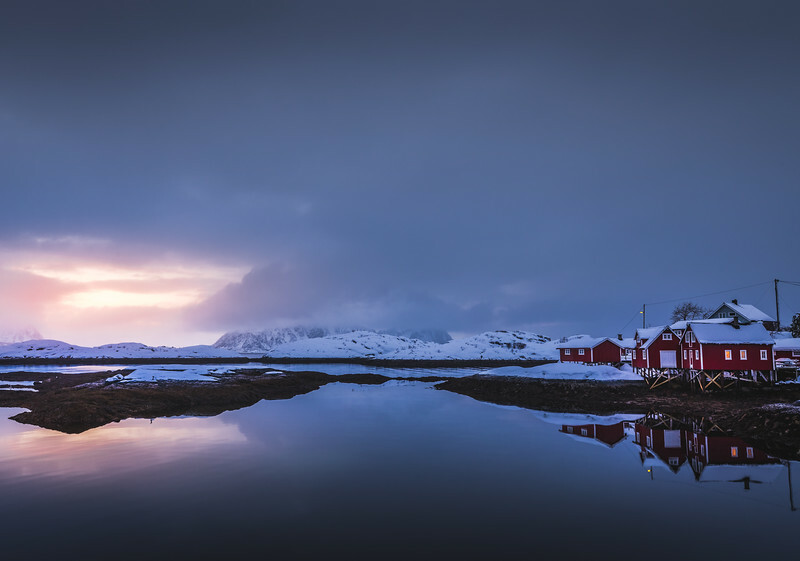 Love how the colour from the sky is reflected in the water and gives this image a balanced look. 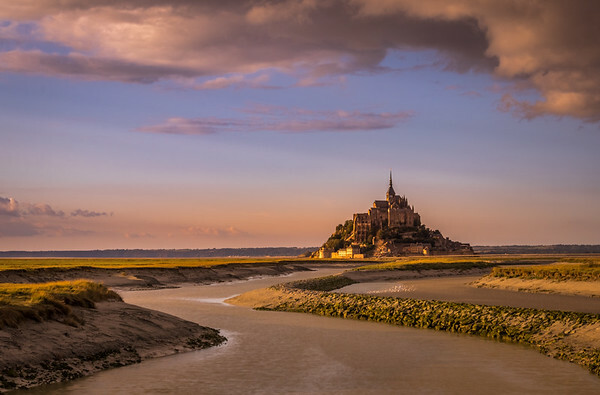 Le Mont Saint-Michel is an island commune in Normandy, France. It is located about one kilometre (0.6 miles) off the country's northwestern coast. The tides can vary greatly (14 Metres), which is reason it was nicknamed "St. Michael in peril of the sea" by medieval pilgrims making their way across the flats to reach the abbey located at the top of the mountain. As dusk sets in on Paris, the city lights turn on. On a summers evening, the city lights overlap with the dusk golden light in the sky creating this amazing scene. 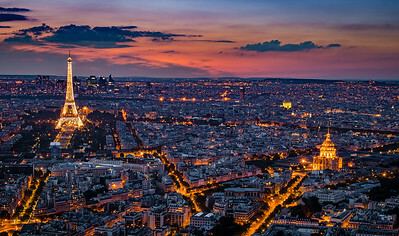 This is a shot from the top of Tour Montparnasse Paris is often referred to as "The City of Light" (La Ville Lumière), both because of its leading role during the Age of Enlightenment, and more literally because Paris was one of the first European cities to adopt gas street lighting. In the 1860s, the boulevards and streets of Paris were illuminated by 56,000 gas lamps. A 9 shot hand help pano from the top of Arc de Triomphe which is one of the most famous monuments in Paris, standing at the western end of the Champs-Élysées at the center of Place Charles de Gaulle. Tripods aren't allowed on the top of the Arch so I had to open the aperture and go with a hand held pano. I took a lot of shots to make sure I had at least one which was sharp in each position, not sure of how the final image would turn out. I finally selected 9 images which panned the entire scene and were sharp enough to produce the final image and I think it turned out pretty well. A gargoyle is a carved or formed grotesque (fantastic or mythical figure used for decorative purposes) with a spout designed to carry water from a roof and away from the side of a building. A trough is cut in the back of the gargoyle and rainwater typically exits through the open mouth. 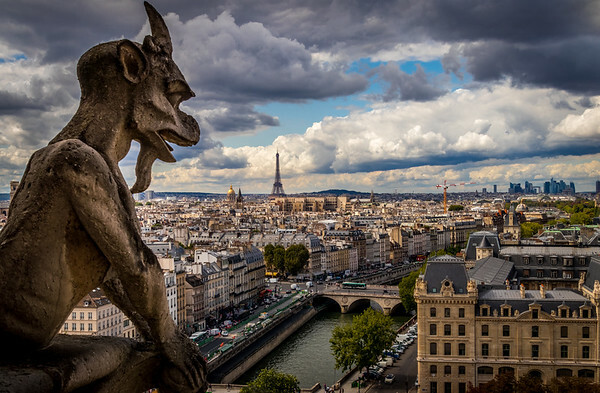 Gargoyles are usually elongated because the length determines how far water is directed from the wall. The term originates from the French gargouille, which in English is likely to mean "throat" and similar words derived from the root gar, "to swallow", which represented the gurgling sound of water. Gargoyles are also said to frighten off and protect those that it guards, such as a church, from any evil or harmful spirits. Many medieval cathedrals included gargoyles and chimeras. The most famous examples are those of Notre Dame de Paris. Pont Neuf ("New Bridge") is ironically the oldest standing bridge across the river Seine in Paris, France. Its famous for its mascarons. The mascarons are the stone masks, 381 in number, each being different and which decorate the sides of the bridge. They represent the heads of forest and field divinities from ancient mythology, as well as satyrs and sylvains. The mascarons remained in place until 1851-1854, when the bridge was completely rebuilt. At the time of the reconstruction, the Renaissance masks were replaced with copies made by noted 19th century sculptors, including Hippolyte Maindron, Hubert Lavigne, Antoine-Louis Barye and Fontenelle. 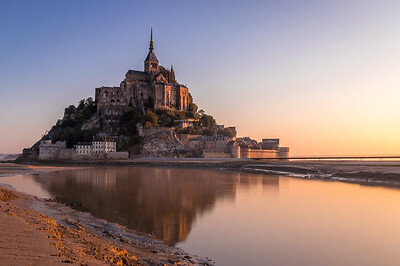 A shot of Mont Saint-Michel at sunrise. An hour of walking through slippery river bed, tall grass and trying to avoid sheep poop while falling twice and getting stuck in quicksand, all the while rushing to catch up with the rising sun, getting this shot was an adventure in itself. This place is surreal, right out of a fairy tale. 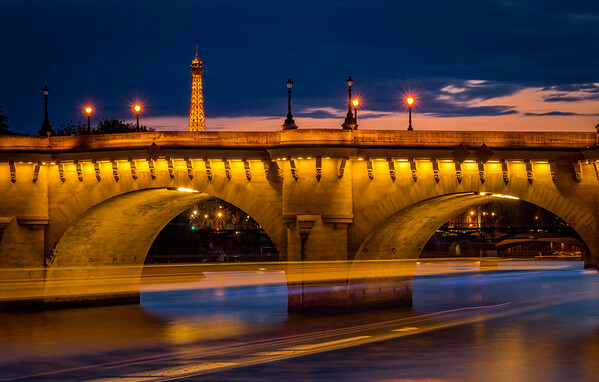 A long exposure shot of the river Seine. 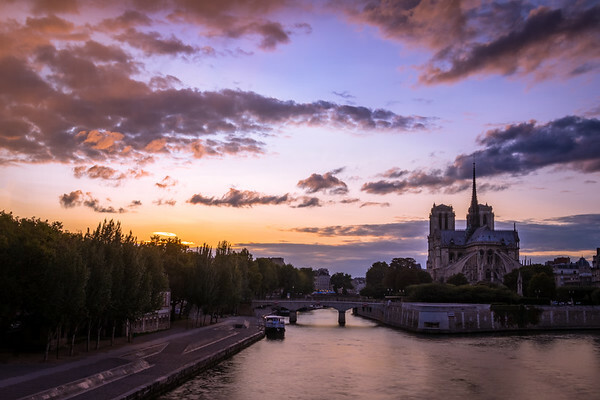 As we left Ile de la Cité (the small island in the middle of river Seine on which Notre Dame is located), we were greeted with one of the most beautiful post sunset sky I have seen. The colours were just exploding in the sky. A 5 shot Panorama to get the Louvre Pyramid with its reflection. I decided to keep the couple in the shot as I think they add to the whole atmosphere. Its the city of love after all. A long exposure shot to get some movement in the clouds and to smooth out the water. 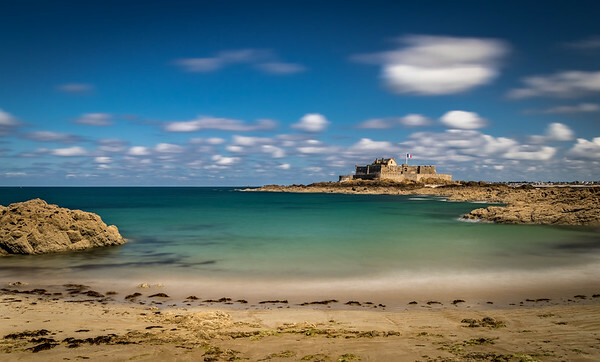 Fort National is a fort on a tidal island a few hundred metres off the walled city of Saint-Malo on the west coast of France. The great military architect Vauban had it built in 1689 to protect Saint-Malo's port. One may visit the fort when the fort is flying the French flag. Access is only possible at low tide during the period from 1 June to 30 September and on certain other days. 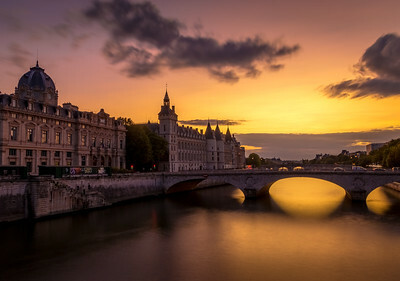 A long exposure shot of Notre-Dame at sunset with a 6-Stop ND filter. Summer sunsets are the most glorious. Winter, Winter Go Away... Cant wait for Summer! A 5 shot bracketed exposure (AEB) to capture this high contrast scene. 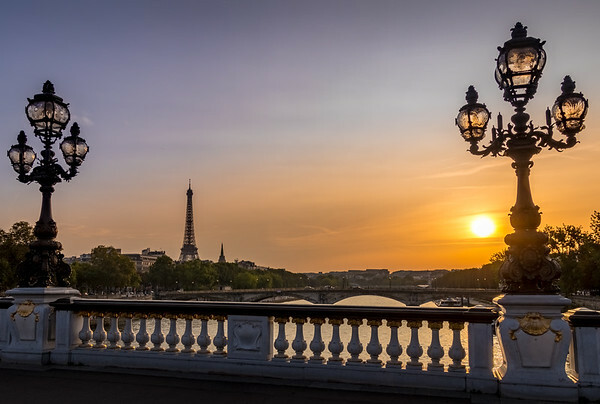 Eiffel tower at sunset as seen from the famous Pont Alexandre III. I used the lamp posts and the bridge itself in an attempt to create a frame and the way the lamps are catching the light from the setting sun is a bonus which I think adds some intrest to the picture. The Pont Alexandre III is a deck arch bridge goes accross the river Seine in Paris. It is the most ornate and extravagant bridge in the city. 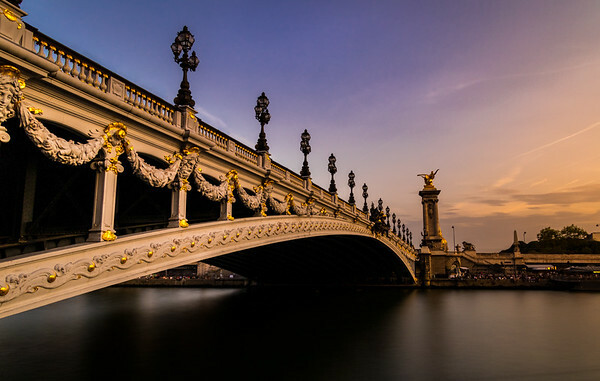 The Pont Alexandre III is a deck arch bridge across the river Seine in Paris. It connects the Champs-Élysées quarter with those of the Invalides and Eiffel Tower. The bridge is the most ornate, extravagant bridge in the city and is classified as a French Monument historique. The Beaux-Arts style bridge, has exuberant Art Nouveau lamps, cherubs, nymphs and winged horses at both ends. Shot from the top of Notre-Dame. We climbed the 387 very steep steps to the top. Due to the central location of the cathedral, the view from the top is really amazing with 360 degree panoramic views of Paris. The clouds rolled in creating this dramatic scene. 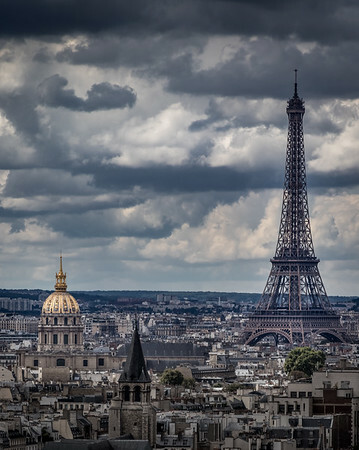 I decided to use the long lens to get a shot of the Eiffel Tower with the dramatic sky. 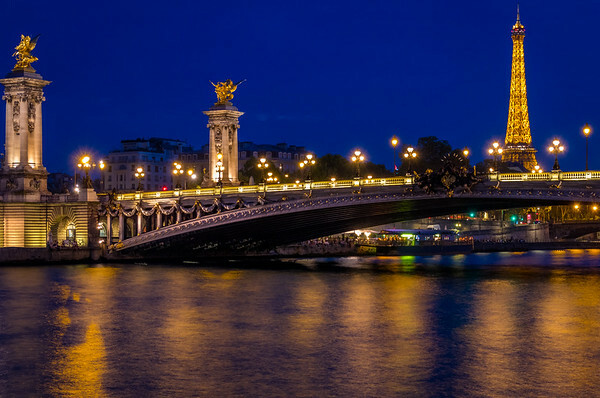 Pont Alexandre III is a deck arch bridge that connects the Champs-Élysées quarter with those of the Invalides and Eiffel Tower. The construction of the bridge is a marvel of 19th century engineering, consisting of a 6 metres (20 ft) high single span steel arch. It is named after Tsar Alexander III, who had concluded the Franco-Russian Alliance in 1892. His son Nicholas II laid the foundation stone in October 1896. It was inaugurated in 1900 for the Exposition Universelle. 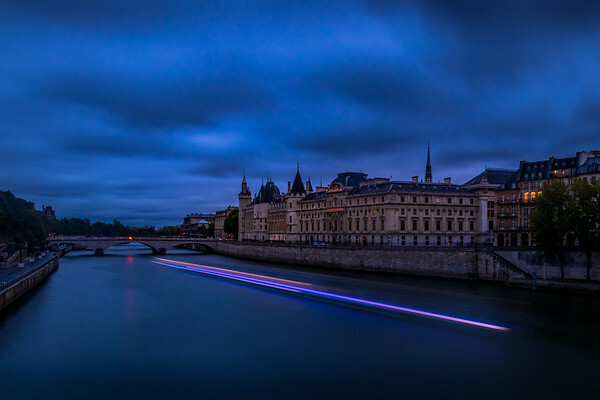 A long exposure of the Seine and Le Conciergerie just after sun down. I took this log expo to show some movement in the clouds and to smoothen the water while a cruise boat with its bright purple and orange lights, entered the frame. I think it adds some intrest to the foreground and probably looks better than just an empty river. Le Conciergerie is located on the west of the Île de la Cité (literally "Island of the City"), formerly a prison but presently is used mostly for law courts. It was part of the former royal palace. Hundreds of prisoners during the French Revolution were taken from the Conciergerie to be executed by guillotine at a number of locations around Paris. The Conciergerie was decommissioned during 1914 and opened to the public as a national historical monument. A shot of the Eiffel tower from Trocadéro which is right across the Seine from the Eiffel Tower. 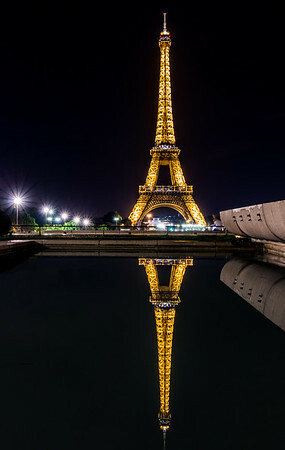 The fountains at Trocadéro offer a great chance to get the towers's reflection. Long exposure to enhance the reflection. Translated to "Our Lady of Paris", is a medieval Catholic cathedral. 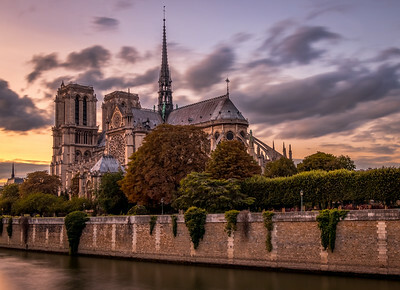 Notre-Dame was among the first buildings in the world to use the flying buttress architecture. The construction started in 1160 and completed in 1345. It became very famous because of Victor Hugo's book, The Hunchback of Notre-Dame, published in 1831. An island commune in Normandy, France, it is located about one kilometre (0.6 miles) off the country's northwestern coast, at the mouth of the Couesnon River. It is 100 hectares (247 acres) in size and has a population of 44. The island has held strategic fortifications since ancient times and since the 8th century AD has been the seat of the monastery. The Mont remained unconquered during the Hundred Years' War; a small garrison fended off a full attack by the English in 1433. Louis XI, turned the Mont into a prison. 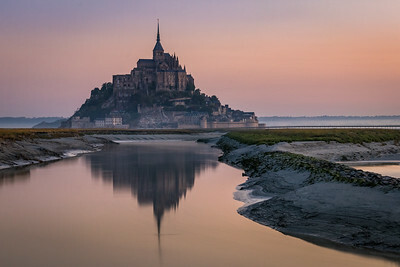 Mont Saint-Michel and its bay are on the UNESCO list of World Heritage Sites. 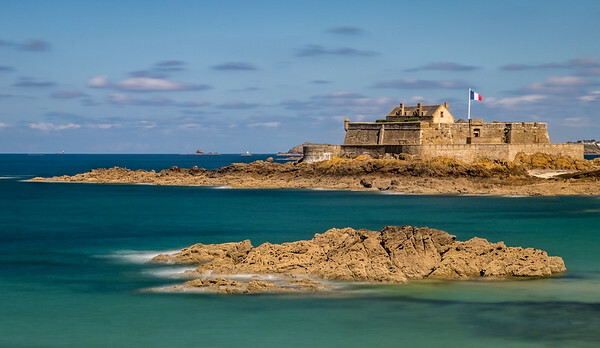 Located on a tidal island a few hundred metres off the walled city of Saint-Malo, It was built by military architect Vauban in 1689 to protect Saint-Malo's port. The fort stands on l'Îlette rock which was originally the site of a beacon that was lit at night to act as a lighthouse. Îlette was also a place of public executions for the seigniory of Saint Malo, which burnt criminals there. The Fort has played major roles in the Anglo-Dutch attack in 1693 and World War II. 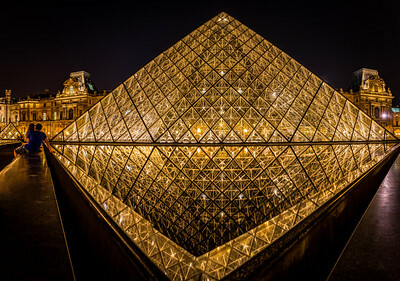 The large pyramid is surrounded by three smaller pyramids and serves as the main entrance to the Louvre Museum. It is constructed of glass and metal and was designed by Chinese-American architect I.M. Pei. 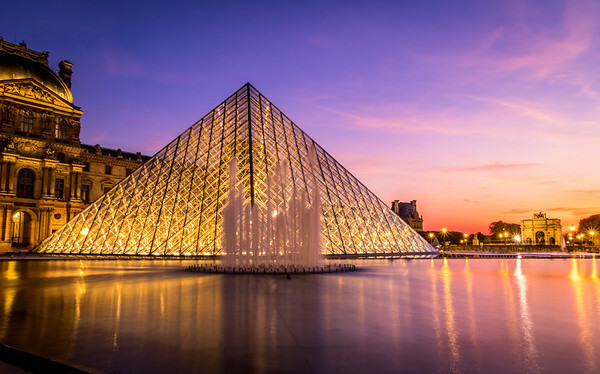 It has been claimed by some that the glass panes in the Louvre Pyramid number exactly 666, "the number of the beast", often associated with Satan. Actually, it consists of 603 rhombus-shaped and 70 triangular glass segments, so 673 in all. 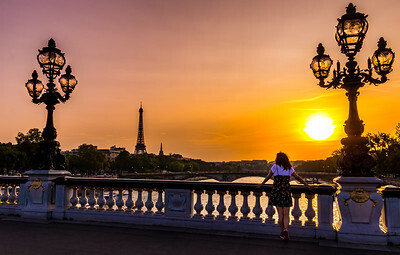 A shot from Pont Alexandre III bridge at sunset looking towards the Eiffel Tower. I love how the lamps catch the golden light from the setting sun. The Beaux-Arts style bridge, with its exuberant Art Nouveau lamps, cherubs, nymphs and winged horses at either end, was built between 1896 and 1900. It is named after Tsar Alexander III. 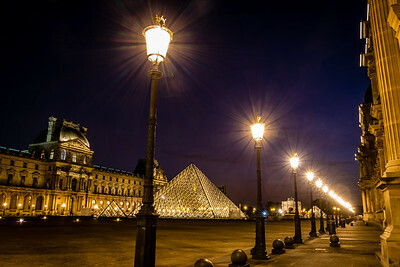 Dusk colours at the Louvre! 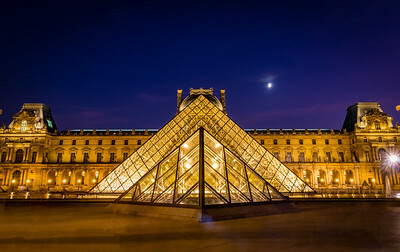 The Musée du Louvre contains more than 380,000 objects and displays 35,000 works of art in eight curatorial departments with more than 60,600 square metres. The Louvre exhibits sculptures, objets d'art, paintings, drawings, and archaeological finds. It is the world's most visited museum, averaging 15,000 visitors per day, 65 percent of whom are foreign tourists. The Basilica of the Sacred Heart of Paris, is a Roman Catholic church and minor basilica. it is is located at the summit of the butte Montmartre, the highest point in the city. 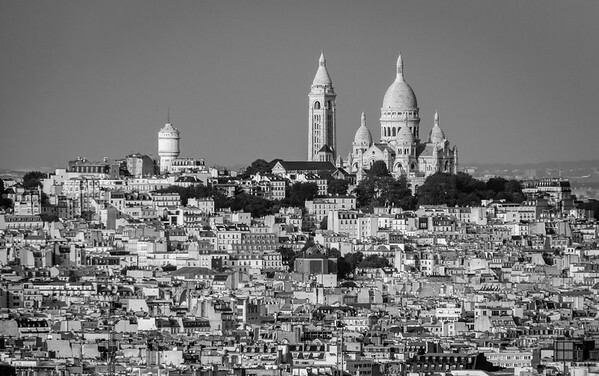 Montmartre is primarily known for its artistic history, and as a nightclub district. Near the end of the 19th century and at the beginning of the twentieth, during the Belle Époque (1872 - 1914), many artists had studios in or around Montmartre, including Amedeo Modigliani, Claude Monet, Pierre-Auguste Renoir, Henri de Toulouse-Lautrec, Suzanne Valadon, Piet Mondrian, Pablo Picasso, Camille Pissarro, and Vincent van Gogh. The Louvre Palace was originally built as a fortress in the late 12th century under Philip II. Louvre is the world's most visited art museum. It houses Approximately 38,000 objects, including the most famous painting in the world - The Mona Lisa by Leonardo da Vinci. A 5 shot bracketed exposure (AEB) to capture this high contrast scene. Eiffel tower at sunset as seen from the famous Pont Alexandre III. I used the lamp posts and the bridge itself in an attempt to create a frame and the way the lamps are catching the light from the setting sun is a bonus which I think adds some intrest to the picture. The Pont Alexandre III is a deck arch bridge goes accross the river Seine in Paris. It is the most ornate and extravagant bridge in the city.